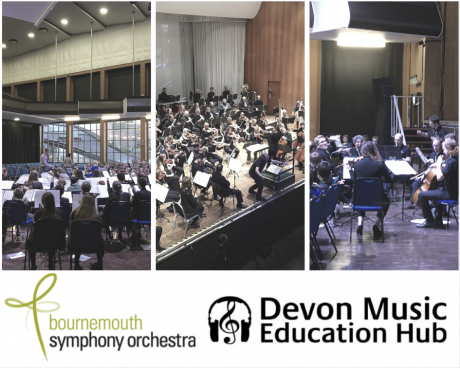 Bournemouth Symphony Orchestra took up residency in Devon last week as they worked in partnership with Devon Music Education Hub on a series of opportunities for young people. The Bash Ensemble carried out a tour of five schools across south Devon, while the BSO’s disabled-led ensemble, ‘Resound’ visited Orchard Manor, Bidwell Brook and Pathfields schools to perform for their communities. A BSO Blast GCSE concert took place in Tiverton for secondary schools with over 200 students enjoying a presentation by Patrick Bailey and an ensemble of BSO Associate musicians. 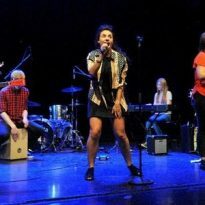 The programme took their audience on a musical tour through history discovering how musical techniques and styles changed and developed over time to help support and contextualise the students’ KS4 courses. 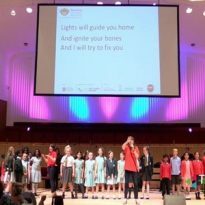 On Friday 1 February, children and young people from 37 schools and some home education groups from across the county came together at Exeter University’s Great Hall. They enjoyed a performance from the full Bournemouth Symphony Orchestra as part of their school concert programme. The Great Hall was also the setting for the jewel in the crown of the week – a massed ensemble of nearly 200 young musicians coming together under the baton of BSO Associate Conductor Maxime Tortelier. After an afternoon of collaboration and working together as an inclusive orchestra on some of the BBC’s Ten Pieces repertoire, they took part in an Orchestral Celebration performance that evening to an audience of family and friends. The young musicians shared the stage with the Exeter University Brass Ensemble as well BSO’s ensemble Resound. 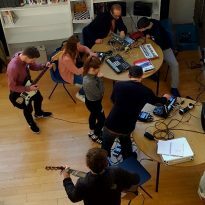 Resound were kind enough to hold a Q&A for staff and students who were interested to know more about their work as professional musicians and talk about how music-making could be more accessible for young people and adults with disability labels. Staff and students working as part of the Devon Open Orchestra initiative were also invited to join the session and were keen to know how best to support young musicians who may struggle to access music education and what music leaders can do differently to help them. 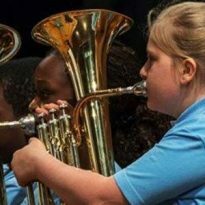 It’s an area that continues to be a priority for Devon Music Education Hub as we look at our overall programme delivering the National Plan for Music Education. 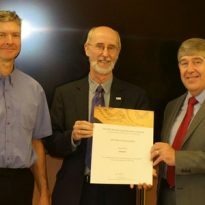 It was a fantastic week and we look forward to working with BSO again in the future, helping them engage with even more schools and providing lots more high quality opportunities for Devon’s schools.